The expeditions objective. January 2016 Ireland’s leading high altitude mountaineer Jason Black will be on expedition to Aconcagua. Standing at 22,834ft above sea level, In what regularly takes four weeks to climb, Jason’s ambition is to attempt to summit the highest mountain in the western hemisphere & Americas highest in full expedition style in just five days, with no time spent acclimatising on the mountain, which will place his body under huge physical demands. In preparation for the climb the appliance of science has been involved as “The Altitude Centre Ireland ” has become a main sponsor for 2016. “It will be curious to see if the altitude process truly translates to the mountain”. Colin Griffin – director ACI , “were delighted to join forces with Jason as a worlds leading high altitude mountaineer his feed back to us will be invaluable to pass on”. Applying science will have huge benefits for Jason’s Mountaineering. To climb serious high altitude mountains you need an incredible level of fitness, but fitness alone will not get you to the top. Your body needs to acclimatise to the reduced oxygen found at altitude. The only way you can do that is to spend extra days at altitude or in this case start the acclimatisation process before the climb. IHE “Intermittent Hypoxic Exposure” stimulates the physiological adaptations necessary to ensure an increased oxygen carrying capacity within the body. “Dreaming of the high mountains is a time honoured fascination for humans. Until recently, climbing in the rarefied air of the highest, remotest peaks on the planet was the exclusive domain of a few highly skilled and intrepid adventurers. Now, for determined individuals following a progression of climbs, step-by-step, My quest to reach the highest point on each of the seven continents leads me to south america and to the challenge of Mt Aconcagua next.” Ive worked so hard since my return from K2, my training has been meticulous putting in four hours cross training daily six days a week for the last two & half months. I’ve left no stone unturned for this attempt on Aconcagua. Ive been on the receiving end of extreme poor weather which has effected summit success on high altitude climbs throughout the world especially since 2013 and im hoping the weather gods are in my favour this time around…. Jason. Located east of the main Andean chain just inside the Argentina border with Chile this region is a very barren isolated environment with the mountain shaped like a big wedge. The slopes faces Northwest ,ending at the enormous col known as Nido del Condores (the Condor’s Nest) . Thos col can be gained from the Horcones valley to the west or the Vacas Valley providing the eastern approach. The rocky east face of Aconcagua is a huge expanse of loose gullies and buttresses. The East side of Aconcagua is much colder and the large Polish glacier flows down sharply from top of the of the South East Ridge. This steep side of the wedge is the colossal South Face ,a 2400m / 80000ft wall of rock and ice which is capped by Aconcagua’s wind beaten North & South Summits. Best months for climbing Aconcagua are December to March ,Weather in winter months most of the area is snow covered and is winds extreme above 5000mts/16,400ft. very common to see a big lenticular cloud around the summit. Temperatures are wide ranging with relatively warm days in daylight as well as bitterly frozen nights when that sun disappears. As a result of bad weather from the south, the Plaza de Mulas Base Camp temperature can drop as low as -18°C, with corresponding temperatures at the altitude camps around -25°C. In good summer weather the temperature at night above 5000 metres is about -20°C and on the summit the average temperature is -30°C although it can be considerably higher during the daytime. The weather phenomenon is referred to as Viento Blanco (white wind) and a summit attempt is extremely dangerous and nearly impossible under such circumstances. Viento Blanco has been known to blow for days on end. These areas are used to acclimatise before ascending and for sheltering park visitors from the winds and avalanches. They are supplied with drinking water and are also the base for park rangers and medical services. It is important to note that all of Aconcagua’s base camps are situated over 4000m in altitude. This already, is higher than the majority of all European peaks and gives you some idea of what a feat climbing this mountain is. Starting the ascent at a height similar to the summit of Mont Blanc (4810m) is not to be done without full and thorough preparation. This route can go by Plaza Argentina or by Plaza de Mulas. Although the second route is shorter and has better services, the first one is less used and more beautiful. If the route that leaves from Plaza Argentina is chosen, Camp 1 is usually set up at 4850m in the first rock spur, and Camp 2 at 5605m among large rocks situated to the right of the inferior tongue of the glacier. These two initial high camps have not been given names but there is a final camp at 6095m which is called Rocas Blancas (or Piedras Blancas). This is an exposed site clustered around white rocks which give the camp its name. There is no water here. If the ascent is through Plaza de Mulas, the first camp is Nido de Cóndores (5350m). Then, taking the Berlín route just before the first zigzag to the right, the journey continues to the east finding Camp 2 mentioned above. This second camp is the most popular after Plaza Argentina but it is open to the elements with little protection from the wind and sun. Fresh water is available from a small river but it is icy cold. Interestingly, above this campsite there is a shallow grave to an Argentinian who died here in 1983. However, the grave was perhaps dug out too shallow, as parts of the man’s clothes can be seen poking through the frozen ground. The Aconcagua massif has its own characteristics and micro-climate, with variable weather patterns including white winds, snowfalls and intense cold throughout the year. Considering this, personal and group equipment must be seriously controlled in respect of quality and quantity. Even in the summer time, temperatures can go as low as 35°C below zero, and winds near 120km may be encountered. In Mendoza it is possible to get good fuel provisions for mountain climbing, including camping gas (butane) in disposable cartridges and white gas. The same is true of our base at Los Puquios campsite in Puente del Inca. Below is a list of the equipment and gear that is needed for climbing Aconcagua. The gear above is required for the Polish Direct route in addition to the technical gear listed for the Normal Route. Altitude sickness is very common on high mountains and its symptoms begin to show above 3000m in height. Anyone can be affected by this problem but it is most often worse in those who are not accustomed to travelling to high altitude and in those who have not allowed their body to adapt or acclimatise to the new conditions. This issue can occur in anybody irrespective of their climbing experience or physical condition. Acute indisposition with headache, nausea, vomiting, insomnia, dizziness, weakness and general health decline. Cerebral oedema, with severe headache, violent vomiting, mental or visual disorder, instability, nausea, coma, inability to urinate, extreme fatigue etc. Pulmonary oedema, evidenced through dyspnoea, cyanosis (blue colour on ears or lips), tachycardia, shortness of breath, coughing, unsteadiness, etc. (These symptoms most frequently appear in the evening after a hard day of ascent). These signs are all stages of the same process, and they are caused by one single denominator: reduced oxygen in the air. Both types of oedemas are serious and must be treated urgently. The individual suffering from them must be removed from the mountain and seen by a medic as soon as possible. All these symptoms, however, may be prevented through proper acclimatisation. Less severe symptoms can be relieved through rest and through drinking plenty of water. 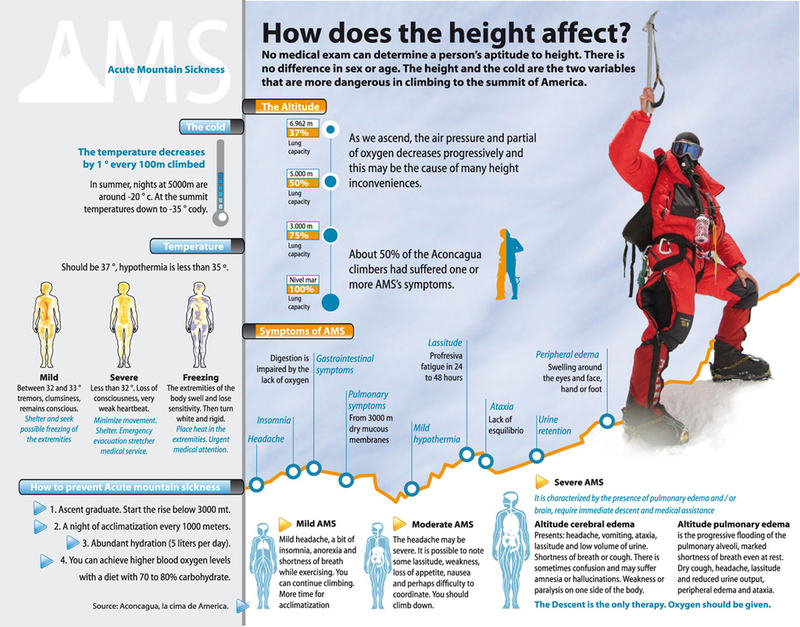 A good knowledge of the signs and the effects of altitude sickness will enable the climber to prevent severe health disorders, or even death, which may occur in a short time. People affected by this illness can recover fairly well by coming down to lower altitudes as promptly as possible. This is not the case with affected people who stay exposed to high altitudes for longer periods which is why quick recognition of the illness is vital. There is a certain level of altitude sickness which is tolerable and is perfectly normal. In these cases, a climber does not have to descend unless the symptoms worsen. A loss of appetite, being unable to sleep and feeling sick are all common and do not pose too much of a risk. A slow ascension is highly recommended from this point, and it is even worth remaining at the current altitude until the symptoms have reduced, at which point it is okay to continue gaining height. The human body is very fragile and can react adversely to high altitudes in other ways. Altitude can cause an eye disorder which causes bleeding of the retina, blood clots and high altitude psychosis which is a mental condition caused by someone who has allowed themselves to be stressed or panicked by the conditions at altitude. It is also common to lose weight at altitude which is a response to the excessive rate at which the body’s digestive system and metabolism have to work to compensate for the rigours of strenuous mountain climbing. This causes the body’s stores of lipids (fats) to be broken down, followed by muscle mass which can cause long term weight loss. Another problem which can arise on Aconcagua is freezing. The severely cold temperatures which occur at high altitudes can cause the body’s extremities to freeze. This is serious if not dealt with quickly and will result in the extremity ‘dying’. Feeling cold in general is something which all climbers of Aconcagua will experience but it is when certain areas become numb to the cold that there is a problem. When exposed to frozen temperatures over a prolonged period the extremities lose all feeling. This is called anaesthetisation and is quickly followed by a changing of the colour of the skin from a normal fleshy colour to white, purple-blue and eventually black. This occurs gradually so there is time to save a freezing extremity, but if blackness is reached the area is useless and will have to be cut off (if it does not fall off naturally itself). The areas most likely to suffer from this fate are the parts furthest away from the body’s core, i.e. hands and fingers, feet and toes, ears and some parts of the face. Unlike altitude sickness, freezing can be entirely prevented by ensuring that exposed areas are covered with suitable clothing for the climate such as gloves and thick mittens, hats with ear flaps, balaclavas, windbreakers and thick dry socks on feet. If freezing does start to show, the affected area must be brought into closer contact with warmer areas of the body and warmed up slowly. MTB 200KM EXTREME & New course record – great to be back in the saddle. The world really is round – Hard as Nails – podcast. Walking through life with a stone in my shoe…..
CRAZY CAVES & ADVENTURE LIFE – Owey Island Co.Donegal. Check our Facebook page for updates.